As already noted, it’s council voting time. 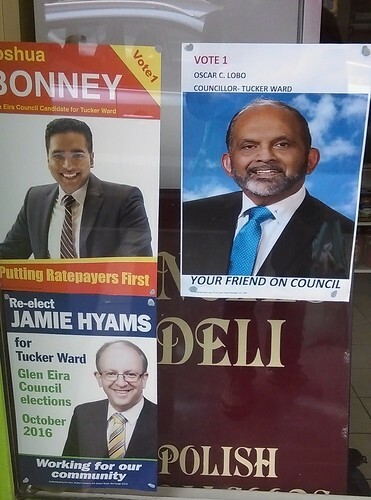 In some council areas, including here in Glen Eira, council candidates aren’t overtly aligned with political parties. But a number of candidates have affiliations. You just have to look for clues. Nina Taylor – Labor aligned – flyer shows a pic of Mark Dreyfus, and it’s authorised by someone I know to be a Labor campaign manager. Preferences exchanged with Rodney Andonopoulos, who is also Labor aligned. Jamie Hyams – Liberal aligned – flyer is authorised by an ex-Liberal state MP, and flyer shows a photo with new Federal Liberal member Tim Wilson. Philip De’ath – Liberal aligned – he and Hyams are preferencing each other, and their flyers arrived in the mailbox together. De’ath’s flyer also has a photo of him with former Liberal MP Elizabeth Miller. De’ath and Hyams both preference Anne-Marie Cade third; so far she’s been invisible in the campaign. Joshua Bonney – unclear – being preferenced by Karina Okotel, who is apparently his sister! Karina was a Liberal senate candidate, though it’s unclear if Bonney is similarly aligned. Michael Searle and Neil Brewster – declare themselves to be independents, and are preferencing each other. Donna Elliot and Michael Karlik also say they are independent. Karlik preferences Bonney. Jim Magee preferences independents and Labor candidates above others. Oscar Lobo, who I thought was Labor aligned, actually preferences independents above known Labor candidates. He’s put his fellow current councillors (Hyams and Magee) last. It’s important to remember that any affiliation doesn’t necessarily mean a councillor will automatically align themselves with that party and its policies. It may give some more insights into their views on particular issues. But I think the best way of determining that is to read the material carefully and discuss the issues that matter to you with the candidates — many of them have been seen at local railway stations and even schools in the past week, and all have a contact phone number and/or email address. Some are also on Twitter and/or Facebook. Based on my contact with candidates, it looks like my top three preferences will be one each of a Lib, a Lab and an independent. And while I don’t have major problems with council services or overall management, recent kerfuffles at council meetings makes me think some new blood would be nice. But I’ll do some more reading in the next few days before sending my forms in. Are a candidate’s preferences listed anywhere? I can’t find them on the VEC site. Often candidates preferences are on their website, social media or how to vote card (that the ‘real’ ones hand out). Researching can be a bit hard in some areas (eg Wyndham) where there could be 35 candidates standing (lots of dummys apparently). Another trick is to look for residents or ratepayers associations. These claim to be independent but often group around certain candidates. In areas where there are foreshores or green wedge land the main split seems to be roughly between pro and anti developer forces. In other areas it may be similar based on ‘saving our suburbs’. I’ve seen candidates handing out how to vote cards in our area (Bayside). Can’t recall this happening in the past. Must be serious. Oscar Lobo’s VEC statement says “In discharging my duties, I have encountered challenges some of which can be read on Google search”. A potentially unwise statement given all the negative coverage of him in the results when you actually do a Google search. Travelling through Caulfield and seeing the concentration of real estate agent signs supporting a couple of candidates I can’t help thinking that these candidates must be in bed with property developers. Otherwise why would real estate agents be providing so much support? I spent half an hour researching my choices not because I have plenty of spare time on my hands but because I like to take my democratic rights/duties seriously. I’ll bet most people don’t bother researching anything, which makes me think there must be a better way of distinguishing candidates than a few bland paragraphs in a VEC statement. I don’t know the solution though. Thanks for the article Daniel – it was just what I was looking for. In some cases it confirmed what I already suspected, but in other cases it was very useful. I really do believe that it should be part of the local government electoral process for candidates to have to declare whether they are members of a political party and, if so, what party. I realize there’s more to their suitability for office than party membership but, on the other hand, party allegiance can be expected to shape their views and voting on council. I won’t, however, hold my breath waiting for my suggested amendment to the Local Government Act to be enacted! As a resident in the City of Casey, I have needed to vote too. All is a postal vote, get the ballot, and a small thing on each candidate and what they stand for. I had never know any of the candidates beforehand, and the short and crammed text of their pitch put me off reading it. So, for the first time in my life, I did a donkey vote. The local hairdresser was in my ward so I voted for him having been a customer of his business for 14 years. I always see him down the street and he is active in the community. Did not really know most of the other candidates but I voted for the ones I actually saw out on the street handing out flyers so I recognised them. I did check one time who had preferences when I was in another ward and 95% of the candidates had deals with one person, including a member of the same family who only seemed to be on the ticket for the preference deal. I have just done the Monash Council Voting. There were 21 Candidates. A crazy 9 Candidates recommended 2 other Candidates (and only those Candidates) in their preferences. So, on principle, they all went last! All 11 of them. Any group of people that would deliberately manipulate the ballot like that does not deserve respect.